Ambassador-designate Philippe Jones Lhuillier arrived in Madrid to assume his post as Ambassador Extraordinary and Plenipotentiary of the Republic of the Philippines to the Kingdom of Spain with concurrent jurisdiction as Non-Resident Ambassador of the Philippines to the Principality of Andorra. He was accompanied by his spouse, Mrs. Edna D. Lhuillier. 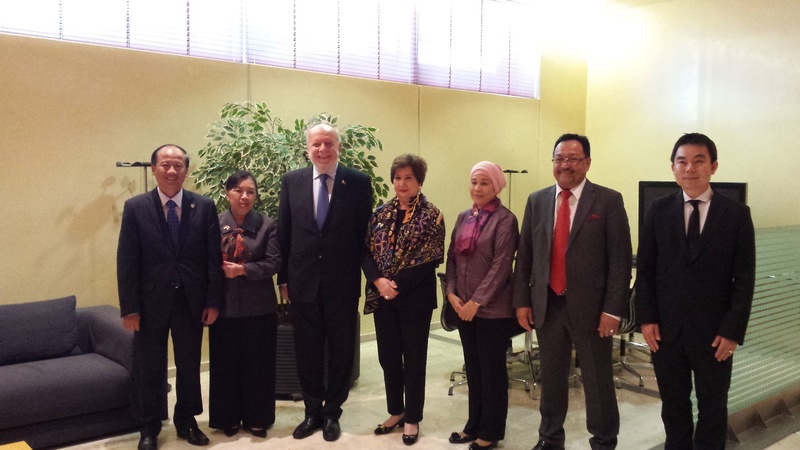 Ambassador and Mrs. Lhuillier were met at the VIP Lounge of the Madrid Adolfo Suarez Barajas Airport by Ms. Nuria Reigosa Gonzalez, Senior Adviser of Protocol of the Spanish Ministry of Foreign Affairs, and Ambassadors of ASEAN-member countries with missions in Spain, namely, Indonesian Ambassador Yuli Mumpuni, Malaysian Ambassador Zainal Abidin Bakar, Vietnamese Ambassador Ngo Tien Dung and Thai Minister Bancha Yeongcheongchareon. From the Embassy, he was met by Mr. Emmanuel Fernandez, Minister and Consul General; Mr. Gerardo Abiog, First Secretary and Consul; Ms. Mary Luck Hicarte, First Secretary and Consul; Mr. Ralf Roldan, Third Secretary and Vice Consul; Defense and Armed Forces Attaché Romulo Manuel, Jr., Labor Attaché Joan Lourdes Lavilla, Welfare Officer Nesa Nolido and Administrative Officer Chester Diaz. Ambassador Lhuillier is a seasoned diplomat, having served as Philippine Ambassador to Italy from 1999 to 2010, and to Portugal, from 2012 to 2016.